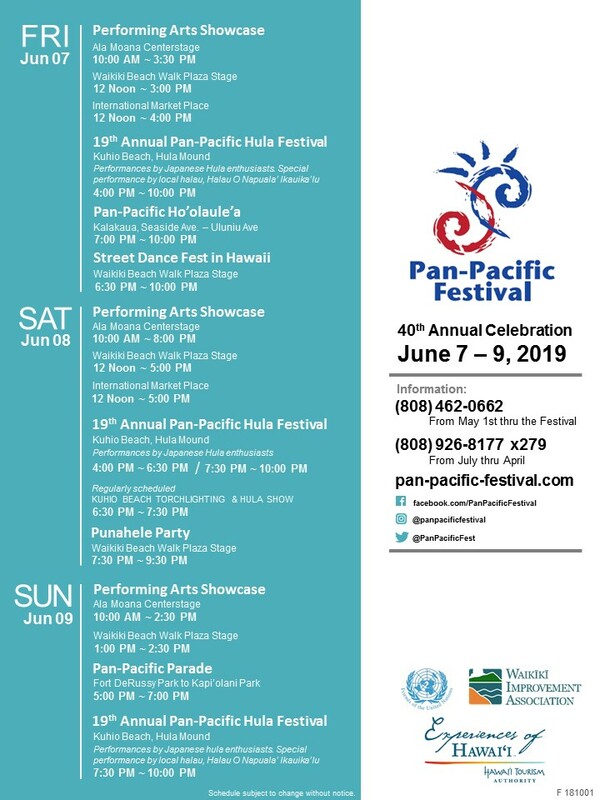 Pan-Pacific Festival presents the Annual Street Dance Fest in Hawaii! Dancers and enthusiasts of hip-hop and jazz-funk dance styles in Japan practice year-round for this opportunity to perform in Hawaii at this exciting and fun event. Likewise, local dance troupes from Hawaii enter the Dance Fest to show off their newest, talented moves in the trendy dance phenomenon. Participants from both Japan and Hawaii will showcase their dance skills as they enjoy wowing the crowd! The commentator at this entertaining exhibition of “street” style dancing is Mr. Kento Mori, a distinguished and premier stage performer. His ability, style, and keen eye in the art of dance have afforded him a career dancing with the world’s best artists, including the late Michael Jackson. Mori has also danced for top musical artists such as Madonna, Chris Brown, Usher, Ne-Yo, Ciara, and Chaka Khan. As a dancer and now as a choreographer, Mr. Mori will comment on technique, style, and execution in this relaxed and friendly competition. Kento Mori will present a special routine on Sunday evening, the last day of our three-day festival, to celebrate the final event of the weekend. Come and see his exciting performance Just prior to the start of the Pan-Pacific Parade, in front of the Moana Surfrider Hotel viewing stand.